located in Winston-Salem North Carolina. 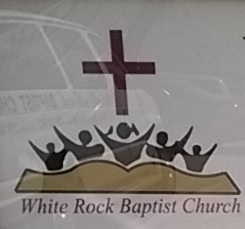 Established since 1949, White Rock is an independent, fundamental Bible believing church that is dedicated to carrying out the Great Commission by reaching the lost with the gospel and building up the believer with the Word of God. We extend a warm hand of Christian fellowship to you and your family and invite you to join us in worship every Sunday morning. At 9:30 AM we begin with an enriching Sunday school lesson that will uplift and educate all in attendance. Our Sunday sermon begins at 11:00 AM. Each thought provoking sermon, given by the Reverend V.C. Crawford, is taught for spiritual growth and transformation into the image of Christ Jesus. If you are looking for a church home, please consider White Rock; the church where everybody is somebody.